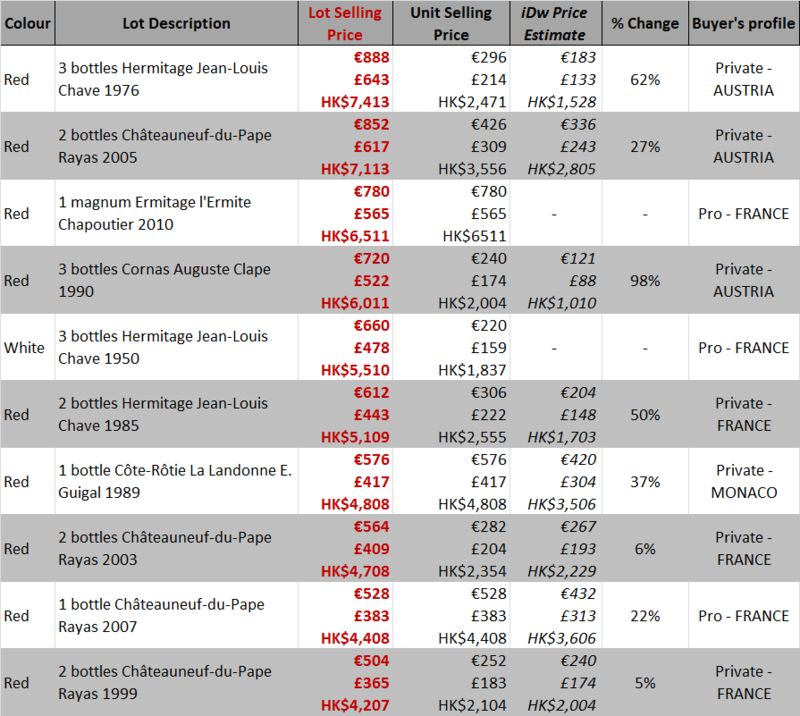 The latest Online Auction that closed on the 1st of April attracted nearly 600 buyers from around the world, who battled it out for some rare bottles, including a collection of Chave from Hermitage and different vintages of Clos Rougeard, red as well as white. 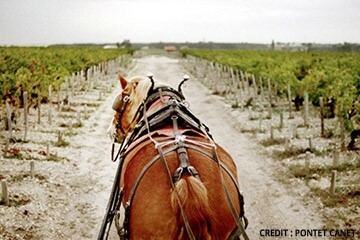 In Bordeaux, it was primarily vintages older than 10 years that pushed the prices up, with one exception: the year 2009. This vintage generated impressive results for Château Pichon Longueville Baron, sold for €172 a bottle, up 10% on the iDealwine estimate, and Château Beychevelle, sold for €83 per bottle (+15%). 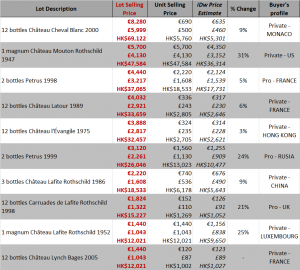 Various vintages of Château Lafite sold well, with the 2000 reaching €1,308 per bottle (+23%). Their second wine, Carruades, also retained its appeal among international buyers, with the 1998 selling for €152 (+ 21%) to a British buyer. Older vintages are always popular among collectors, especially when they are offered in magnum: one of Château Mouton Rothschild 1947 sold for €5,700! In Burgundy, however, it is not so much about the age of the wine, but rather the scarcity effect that raises the prices after its release. The Chambertin Vieilles Vignes 2010 of domaine Dugat-Py is a good example and crossed the threshold of €1,500: it was acquired for €1,530 by a Danish buyer. 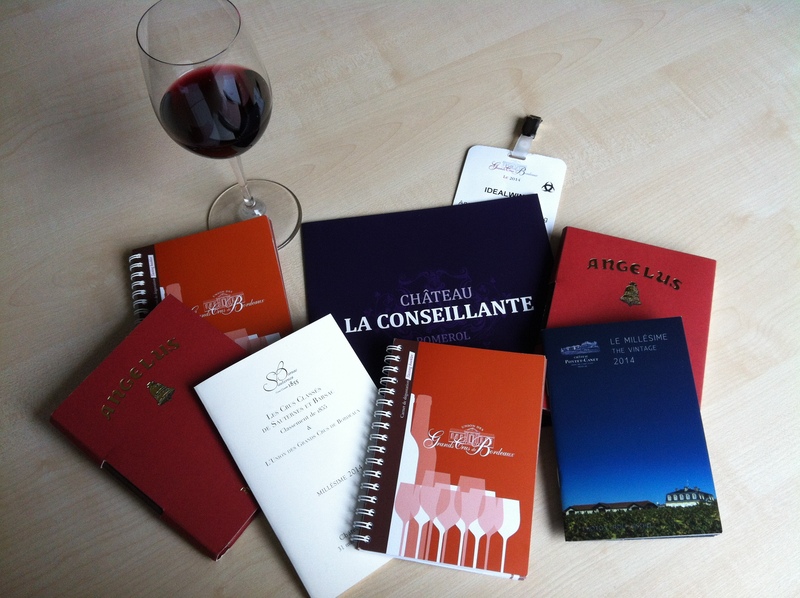 The 2011 vintage, which started appearing at wine auctions, has successfully achieved high prices. 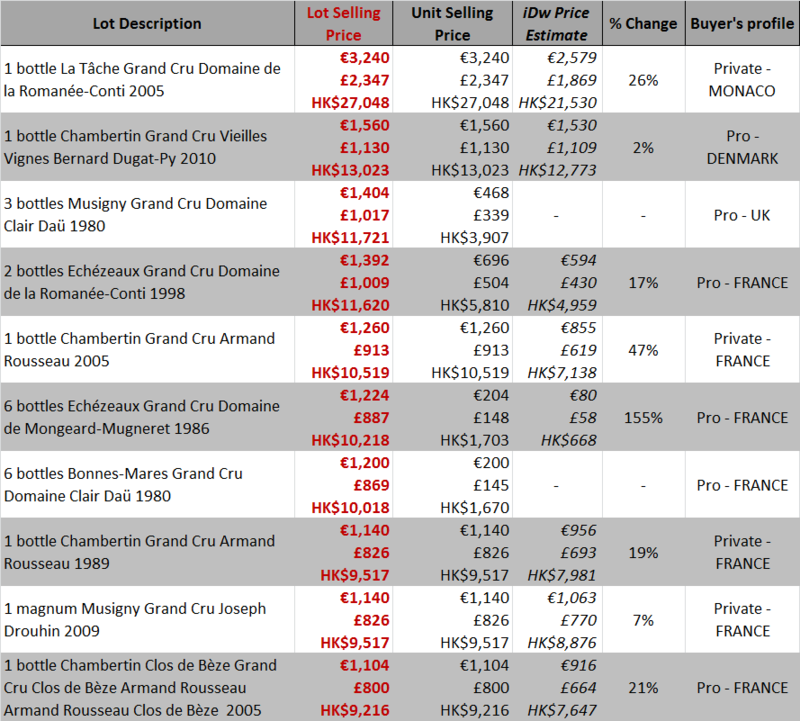 A Vosne-Romanée Cros Parantoux (domaine Rouget) sold for € 648, while a Montrachet of Ramonet reached €672. Young wines ignited the auction, but older bottles were also well-received. This was the case with wines of Clair-Daü: a Musigny 1980 sold for €468 to an English buyer, while a Bonnes-Mares of the same year will travel to Singapore (sold for €240). 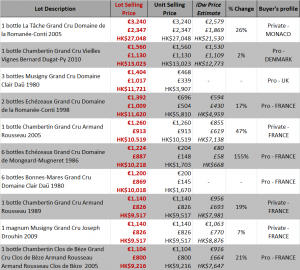 The flagship areas of Côte de Nuits (Romanée-Conti, Armand Rousseau) continue to attract buyers and a collector from Monaco paid €3,240 (+26%) for a bottle of La Tâche 2005, while a 2005 Chambertin of Rousseau sold for €1,260 (+47%). Among the Rhône wines, it is once again Jean-Louis Chave that sets the tone in this very active region at auctions. The hermitages of this key area of northern Rhône were plentiful at the recent auction and led to great bidding wars between European and American buyers. The Hermitage of 1985 sold for €306 and the 1976 for €296, while the white 1950 reached €220. Also note the great success of Cornas 1990 from Clape, awarded €240 per bottle (+98%!). In the southern Rhône at Châteauneuf, Château Rayas stood out again with the 2007, which reached €528 (+22%), a 1995 reached €504 (+23%) and a 2005 sold for €426 (+27%). In the Loire Valley, an exceptional series from Clos Rougeard was grouped together for this sale. 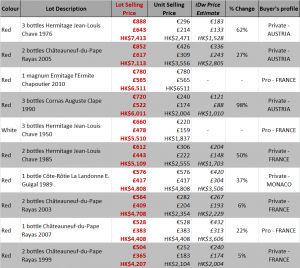 This resulted in a significant price increase on all vintages: +103% for the Saumur-Champigny Le Bourg 2007, reaching €280, while the 2010 of the same wine, which was not listed on iDealwine, reached €386! 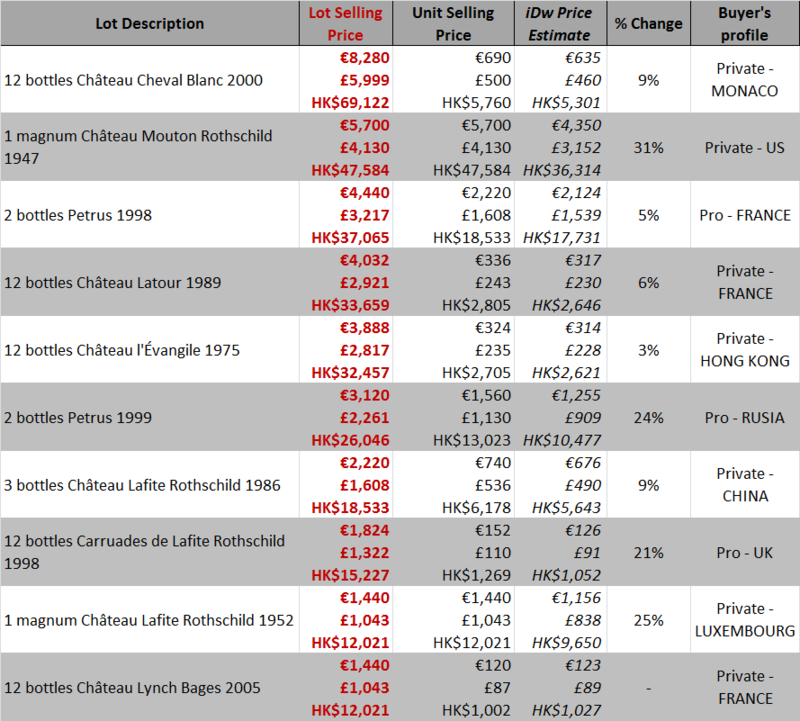 The Loire’s sweet Huet wines also usually garner great results and the Constance 1989 sold for €240 (+36%). Fine vintage Champagnes also sold at higher price levels, with the Krug Grande Cuvée especially popular, selling for €192 (+60%). 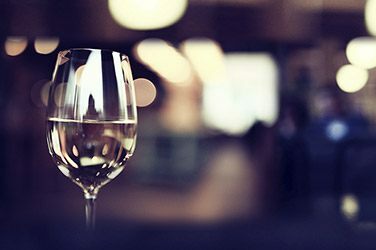 The Languedoc’s Grange des Pères approached the threshold of €200 a bottle, while a few wines from the rest of the world – particularly Pingus from Spain and Opus One from the US – also stood out. Fellow wine lovers, your privacy is hugely important to us at iDealwine. 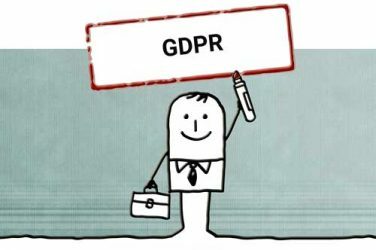 We lay out how we’ve prepared for the famous GDPR directive.